Situated within Tower Works, a former steel pin factory and relic of the Leeds textile industry, is a new film installation by Mathieu Kleyebe Abonnenc. Commissioned by the Leeds-based arts organisation Pavilion, Abonnenc’s work places its critical focus not upon the industry of textiles, but on the industry of copper, and deals specifically with the colonial plundering of the rich copper resources in Katanga, a southern province of Congo with an enduring history of exploitation. Abonnenc’s An Italian Film (Africa Addio) revisits the violence and brutality associated with the copper export that took place in Katanga. To access this turbulent history Abonnenc deploys the Katanga cross, an archaic form of copper currency once prevalent throughout Africa. These crosses were heavily looted from the region during Belgian colonial reign, taken to fund the industrialisation of the West. 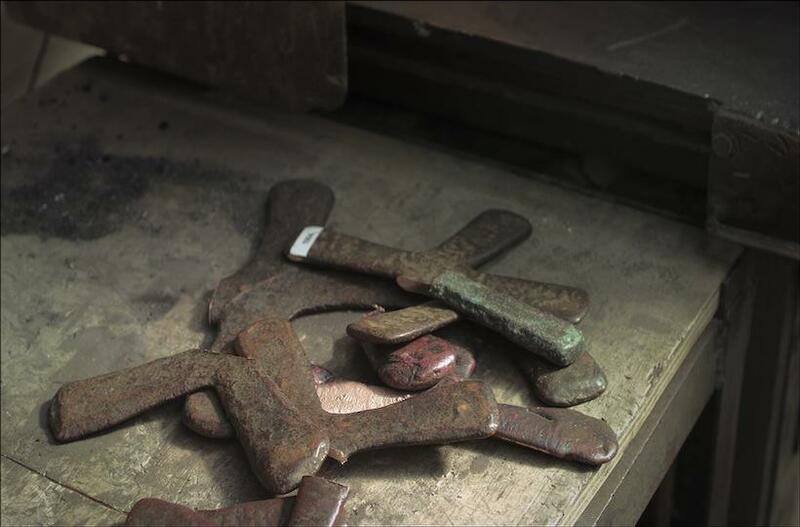 Abonnenc puts ten copper crosses through a similar process of destruction and transformation, as his film depicts the artefacts being cut, melted down and recast within a foundry workshop in Yorkshire. 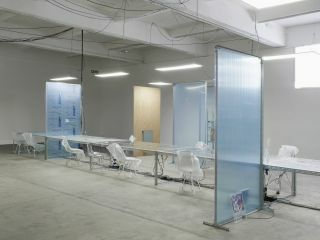 The film presents imagery of workshop activity interlaced with voice-over narration. Two young voices, representative of Congolese children, speak of Katanga’s troubled history of copper production, export and the death that accompanied it. We are told the story of the crosses, of how they were manufactured by an indigenous guild of workers known as the ‘copper eaters’, and that it was a sacred profession, involving initiation, secrecy and superstition. 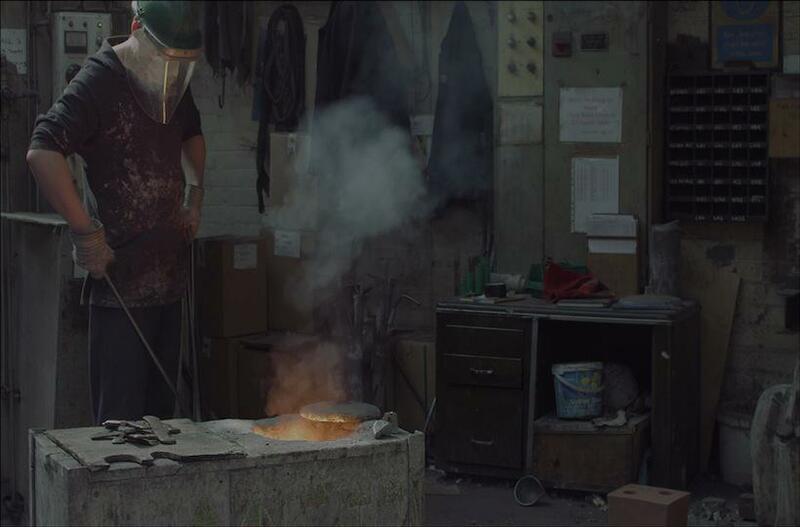 As voice and image coalesce, the actions of the contemporary foundry workers start to evoke those of the past. Tasks that at first seem unremarkable and quotidian, such as the compression of sand within a mould, or the smoothing of the sand with the finger tips, become imbued with greater significance. Abonnenc creates a strong resonance between past and present, leading us to focus on the ancient, unchanging quality of the labour we are witnessing. With ceremonial precision an incandescent pot of molten copper is raised out of the furnace and carried into position. Plumes of steam rise and bellow forth as the flaming liquid is poured into the sand moulds. This careful rhythmic process begins to resemble a ritual. Abonnenc’s film not only draws attention to the archaic nature of the casting, but also places emphasis on the violence contained in such a process. One such moment of palpable violence can be witnessed in the melting of the copper crosses. Filmed with arresting clarity, the camera places us at the heart of this hostile procedure. In close-up we see sheared fragments of the amputated crosses fed into the volatile belly of the furnace, consumed by a white-hot liquid that spits and crackles. Abonnenc’s process of recasting can be seen as a symbolic gesture, a way of revisiting the trauma of the past without repeating it. Abonnenc utilises the violence of casting to speak of Katanga’s painful history without subjecting the viewer to shocking imagery of execution and massacre. Through its destruction of the copper relics, Abonnenc’s casting mirrors that of Western industry, yet simultaneously these acts of melting and moulding profoundly evoke the original techniques used by the ‘copper eaters’ to forge those relics. The crosses come to symbolise and embody not only the traditions and heritage of Katanga, but also the colonial devastation of that heritage. 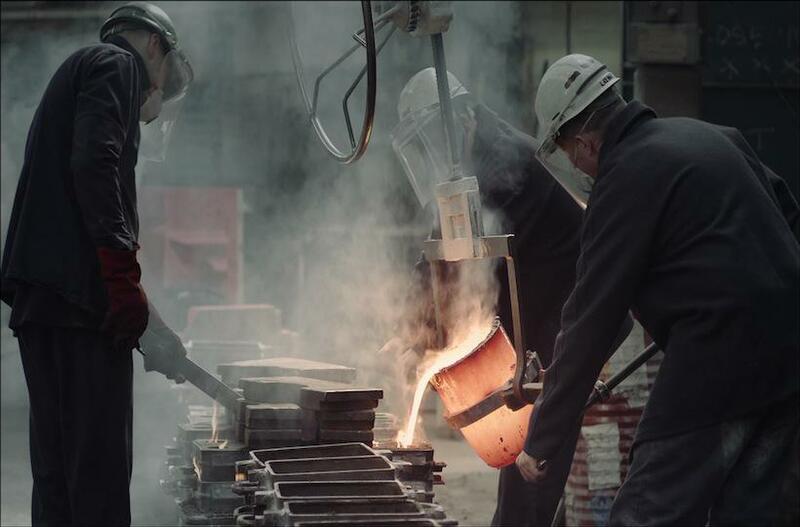 Screened within the old engine room of Tower Works, Abonnenc’s film effectively reanimates the space, making it once more the site of industrial production. The effect is powerfully immersive, as filmic space and the surrounding environment converge. By placing the film within this particular historical site of local industry, Abonnenc generates a dialogue between two parallel histories of industrialisation, and confronts us with our colonial past. Adorning the walls of the engine house are plaster relief portraits of the founding fathers of industry. Structures of hierarchy become enacted within the space, as these figures of industrial power loom and watch over the factory workers of the film. The genesis of Abonnenc’s project came from the controversial 1966 ‘exploitation documentary’ Africa Addio. Made by the Italian film-makers Jacopetti and Prosperi, the film presents a very different treatment of colonial violence. Showing death for the purposes of shock and entertainment, the film was accused of participating in the colonial crimes it claimed to be criticising. Made with Africa Addio in mind, Abonnenc’s work can be seen as a response to these Italian film-makers, as he uses their film to initiate a discourse on the imaging of colonial horror. At its heart, Abonnenc’s work is concerned with the problematic relationship between history and representation, asking how we return to moments of colonial trauma and atrocity without repeating them. 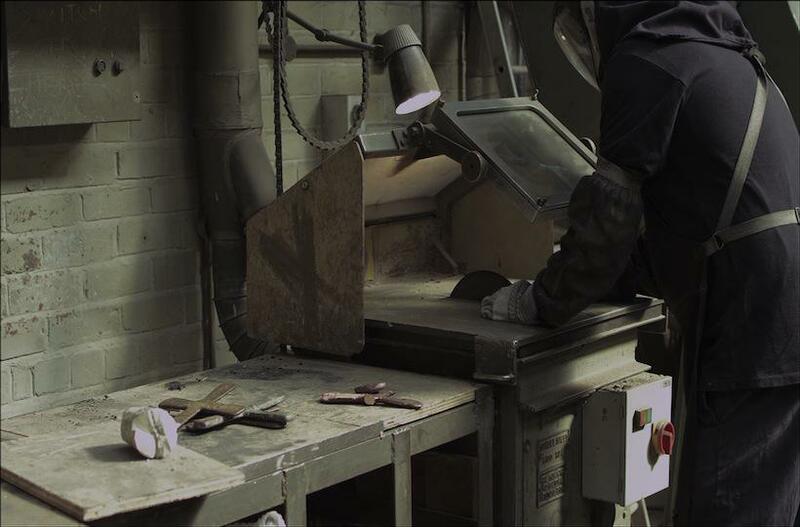 Abonnenc’s film intimately situates the viewer within one part of the colonial moment, that of industrial manufacture. Through careful synthesis of voice, image and surrounding location, Abonnenc imbues the routine activity of copper casting with the weight of a painful history. Abonnenc’s recasting of the Katanga crosses is a form of re-enactment, as he condemns the copper ‘bodies’ to a brutal undoing, yet returns to these moments of trauma without sensationalism or sentimentality.